It all started because my scrap container for quilting cottons, one of those large plastic tubs, was filled to overflowing. In the back of my mind, I kept trying to think of how I could use those scraps. I began to notice English paper piecing projects featuring hexagons. Amanda Jean from Crazy Mom Quilts acquired an old hexagon quilt and has been sewing a replica of it. In my Instagram feed, hexagon blocks and quilts have been featured in recent posts from The National Quilt Museum, All People Quilt, Aurifil Thread, Christine, and Vivian. Although I’ve done hand quilting, I’ve never tried hand piecing. 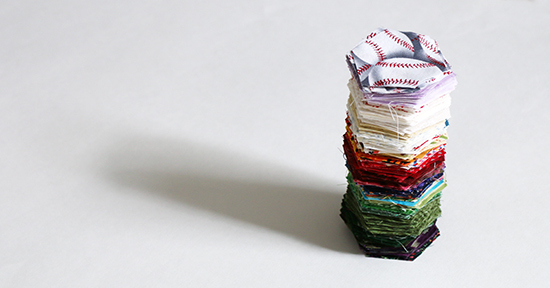 I spent some time reading about English paper piecing, and it seems like something I could enjoy doing. With a block-based design, I could easily keep one or two blocks’ worth of hexagons at the ready as an on-the-go project. Back in 2000, I made a baby “I Spy” quilt using a set of Marti Michell templates. In addition to the two-inch hexagon that I used for that quilt, Template Set G includes a template for a one-inch hexagon. That happens to be the finished size I had in mind for this project idea that was slowly taking shape. With the fabric template all set, I looked online at pre-cut hexagons to serve as the “paper” aspect of my paper piecing. Frugality won out; I have some card stock that is too thick for my printer and I found a free hexagon template download at Geta’s Quilting Studio. I printed a template onto standard paper and set that on top of five sheets of card stock to cut out the paper hexagons. The process was fussier than I would have liked, but within a relatively short time I had 100 sturdy paper hexagons. I punched a hole in the center of each piece, through which I’ll be able to pin the fabric to the paper. While sorting through the fabric in the plastic tub, I set aside all of the pieces that were at least 2 1/4 inches (5.7 cm) wide but no more than double that width. 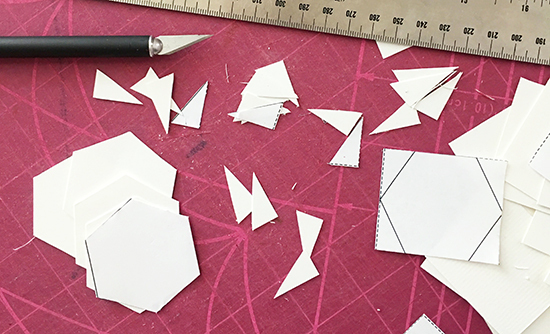 My goal is to cut all of these smaller scraps first, then choose larger scraps after I assess how many more hexagons I need and which colors are lacking. At the halfway point of cutting that first set of scraps, I have about 400 hexagons. I’ve been putting them up on my design wall to get a better idea of the range of colors but I’m running out of room! I have a few directions in mind for the design but want to see where the colors take me. And the design will likely dictate the size. I can’t wait to see what I make! What are your thoughts on English paper piecing? Wow! 1" paper piecing! That will take some tiny stitching. The colors look beautiful. I love to cut up scraps into quilting pieces. But I don't care for sewing around and around little hexagons. Good Luck! Thank you, Ruth! I don't know yet whether I'll care for it, but there's only one way to find out.